Full to the brim with information on all the latest Piaggio scooter models! Want to buy a new Piaggio scooter? Scooter Crazy are part of Ron Daley Scooters, a main Piaggio dealer supplying all the latest models including the Piaggio Zip, Typhoon, Medley, the Piaggio Beverley. 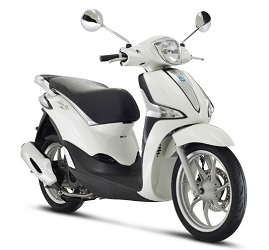 We have the full range of Piaggio scooters for sale! 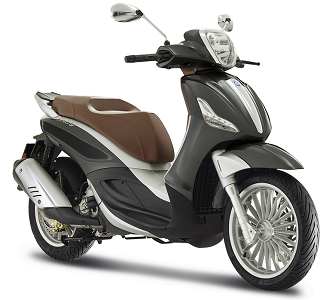 We offer competitive finance across all Piaggio mopeds as well as delivery across mainland UK. Call us on 01226 203377 for further details. The Piaggio Liberty scooter offers urban mobility with contemporary styling. 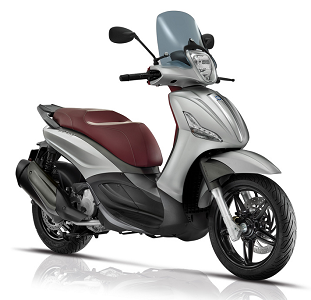 The perfect all rounder, fitted with the new, high performance i-Get 125cc engine from Piaggio. This scooter is designed for city living. Nipping through busy streets with ease thanks to it's agile and fluid performance. The electrically unlocked seat houses space for a jet helmet with visor and theres also a storage compartment in front of the rider, while the analogue speedo with digital fuel and distance readouts give at-a-glance information to ease every journey. Piaggio has a selection of high-wheeled scooters including the Liberty and the Medley, however, when it comes to performance, attention to detail, safety and practicality, the new Piaggio Beverley 300 has established itself as a benchmark in the scooter world.Powered by a single cylinder 278 cc Euro 4 engine with catalytic converter exhaust, single cam four-valve distributor and electronic fuel injection. The scooter comes with ASR traction control and ABS assisted brakes as standard and offers unpresidented comfort and sophistication. Sound good? Why not give us a call on 01226 203377 for more details. 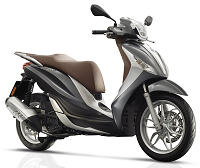 Due to it's popularity first time round, the two stroke version of the Piaggio zip has been reintroduced. The extra 'zip' produced by the HiPer2 Air Cooled engine produces a sparkling performance that maximises the nippy and agile character of this top selling model. 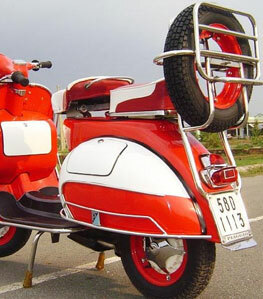 Available in black, white or red this stylish little scooter is suitable for everyone! Scooter Crazy also have a superb selection of genuine Piaggio Zip accessories including screens, leg covers and topboxes. 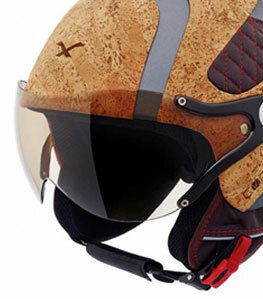 To see the full collection click on Piaggio Zip Accessories. 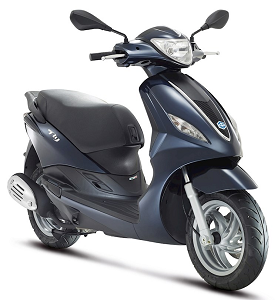 The Piaggio Beverly 300 has now been joined by the Beverly Sport Touring 350cc which features enhanced performance, increased safety and fantastic practicality. The first scooter in the world to feature both ABS and traction control. 33bhp @ 8,250rpm and doing a massive 86mpg. This bike really is beautiful with a comfort saddle and flyscreen fitted as standard. The Typhoon underwent a drastic style re-vamp last year, particularly in the steel grey colour with funky commando style graphics. The Piaggio Typhoon scooter has a more aggressive look and feel and is already proving incredibly popular amongst our younger riders. Ideally available in both a 50cc and a 125cc. An ideal commuting scooter with larger, chunky tyres. Other colours are available. 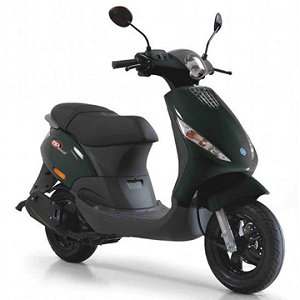 We are delighted to offer this classic, elegant moped within the Piaggio scooter range. The Medley comes with a strong and reliable 125cc i-Get engine which provides power when needed and produces a seamless riding experience. The design has been made with comfort and distance in mind. A good sized, luxurious saddle means that even the longest of journeys on your Piaggio Medley scooter are enjoyable ones. Available in a choice of colours, with finance and delivery available subject to status. 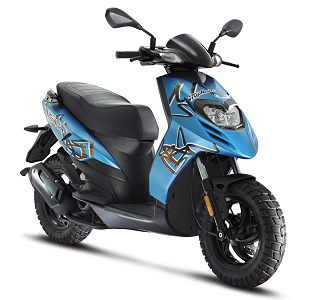 The Piaggio Fly 50 is equipped with a four-stroke Hi-PER4 50cc engine for incredible economy. A protective shield and rigid steel tube frame ensure safe, precise riding, whilst a powerful, reliable front disc brake contributes to total rider confidence. The Piaggio Fly features telescopic hydraulic forks and 12" wheels with large tubeless tyres for easy handling and safety even on rough roads. The Fly's large footrest offers plenty of space for the rider's feet, as well as allowing room for stowing a bag on the useful hook at the front of the seat. There is also a glove compartment and ample space for a helmet under the seat. The instrument panel is clear and easy to read, and incorporates a clock and calendar.The Piaggio Fly 125 3V has a protective shield and rigid steel tube frame ensure safe, precise riding, whilst a powerful, reliable front disc brake contributes to total rider confidence. The Piaggio Fly features telescopic hydraulic forks and 12" wheels with large tubeless tyres for easy handling and safety even on rough roads.The Piaggio Fly 125cc is equipped with a single shock absorber at the rear that has adjustable spring pre-load to suit all riding styles. The Fly's large footrest offers plenty of space for the rider's feet, as well as allowing room for stowing a bag on the useful hook at the front of the seat. There is also a glove compartment and ample space for a helmet under the seat. The instrument panel is clear and easy to read, and incorporates a clock and calendar. The Fly 125cc is also fitted with an electronic immobiliser system, ensuring a greater level of security when the bike is parked.